3.10.5.10 The amount of debt a government may incur is limited by the State constitution (Article VIII, Section 6) and individual statutes. Debt limits are based on total taxable property value and vary by type of government. Each government should calculate its available debt capacity each time it is considering issuing additional debt. 3.10.5.30 Use the appropriate government type spreadsheet in the Calculation of Limitation of Indebtedness to automatically perform the calculation. If the specific entity type is not available, use the general spreadsheet. 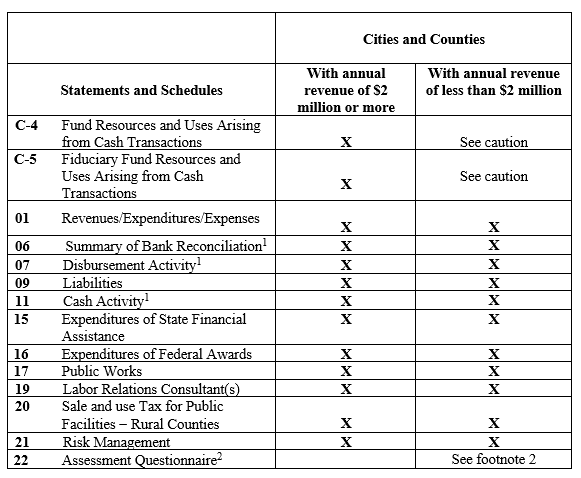 With the proper adjustments, this spreadsheet can be used by any municipality to compute its debt limit. Calculate both the constitutional and statutory debt limits. 3.10.5.40 What is the difference between the constitutional debt limit and the statutory debt limit? 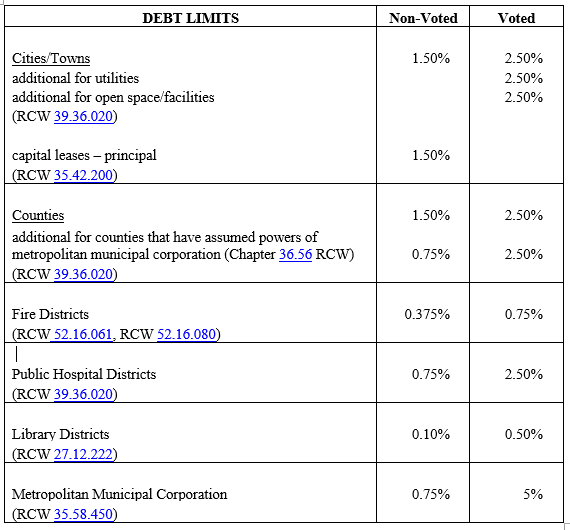 Although state law (RCW 39.36.060) allows cities and counties to exclude public loans from the statutory debt limit, these loans are not excluded from the constitutional limit (RCW 39.69.030). 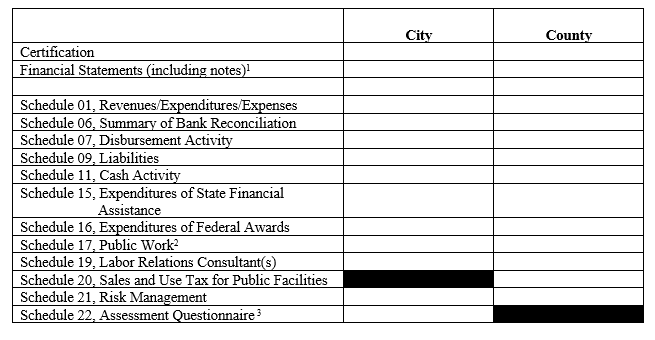 Example – Assume a city has taken out Public Works Trust Fund loans that are considered to be general obligation debt and equal to 1 percent of its assessed valuation. These loans are excluded from the statutory debt limit calculation (1.5 percent), but not from the constitutional debt limit calculation (also 1.5 percent). Its statutory margin of indebtedness without a vote would still be 1.5 percent. However, it could only issue an additional 0.5 percent of non-voted debt because to issue any more would exceed the constitutional limit. Note that many government loans (including some of the Public Works Trust Fund loans) are not considered a debt because utility revenues will pay the debt service. Therefore, they are outside both the statutory and constitutional debt limit calculations. 3.10.5.50 What is debt for the purpose of calculating my debt limit? Debt has been broadly interpreted to mean all borrowed money payable from taxes. This includes all general obligation debt, but not obligations payable from nontax revenue sources, such as revenue bonds. Also, obligations that can be discharged from funds currently available, such as warrants and accounts payable, are not considered debt for purposes of these statutes. General Obligation Bonds (Voted and Non-voted), including bond anticipation notes which are to be paid off with the proceeds of the bonds. Include interest only if it has matured and is due and payable. Deep discount debt (e.g., zero coupon bonds). Report the face amount of the bond less the unamortized portion of the discount. 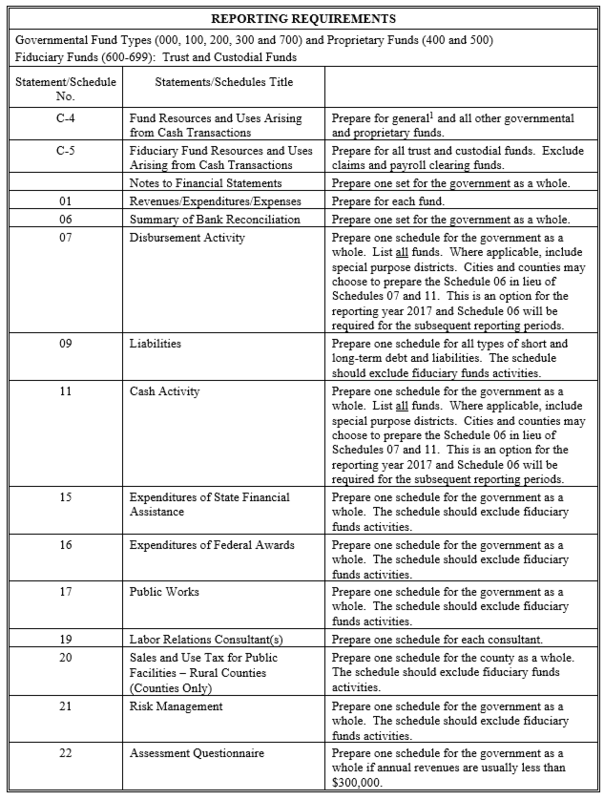 Registered warrants issued against the general (current expense) or other tax supported funds. Lines of Credit, to the extent they are drawn upon. 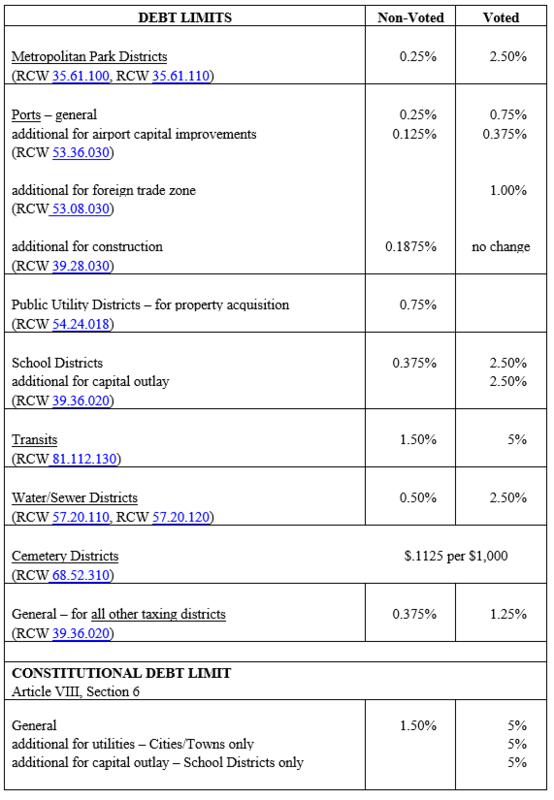 NOTE: Counties should not include the debt of junior taxing districts. 3.10.5.80 What is the difference between non-voted and voted debt? Non-voted debt is issued without a vote of the taxpayers. The debt service on non-voted debt is paid out of general government revenues. Voted debt is authorized by the taxpayers at an election. The debt service on voted debt is paid from excess property tax levies under RCW 84.52.056. 3.10.5.90 What is the government’s total taxable property value? It is the assessed value of taxable property in the county, city or town, ascertained by the last assessment for state or county purposes. Incorporated cities should also include the timber value as defined in RCW 84.33.035. For purpose of calculating the debt limit, local governments should use the last assessed valuation of taxable property. The last assessed valuation is the valuation placed on the last completed and balanced tax rolls of the county preceding the date of contracting the debt (RCW 39.36.010, RCW 39.36.015 and RCW 84.52.080). 3.10.5.100 What assets are available to pay debt? Include all applicable cash and cash equivalents available for the payment of general obligations. This includes cash in debt service funds reserved for the payment of general obligation debt. Generally, cash outside of debt service funds is used to meet current obligations. Do not include cash or investments that are restricted for other than debt payment purposes. Do not include cash or investments that will be used to make interest payments during the initial months of the subsequent fiscal year prior to property tax collections. Also, do not include uncollected taxes from prior years except taxes specifically levied for debt redemption. 3.10.5.110 What is the government’s debt limit? See the table below for constitutional, general and entity specific limits. If the entity type is not listed, use the general (for all other taxing districts) limits. 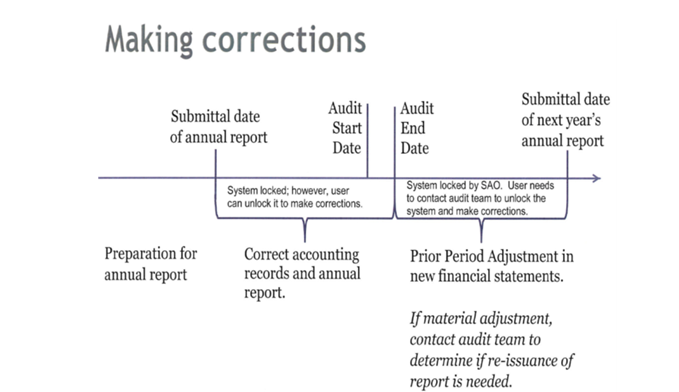 Also, review the RCW’s for the specific entity type to identify any additional requirements.